This topic contains 9 replies, has 2 voices, and was last updated by Paul 1 year, 1 month ago. When I go to fullscreen the background goes black. Is there a way to make the background white? 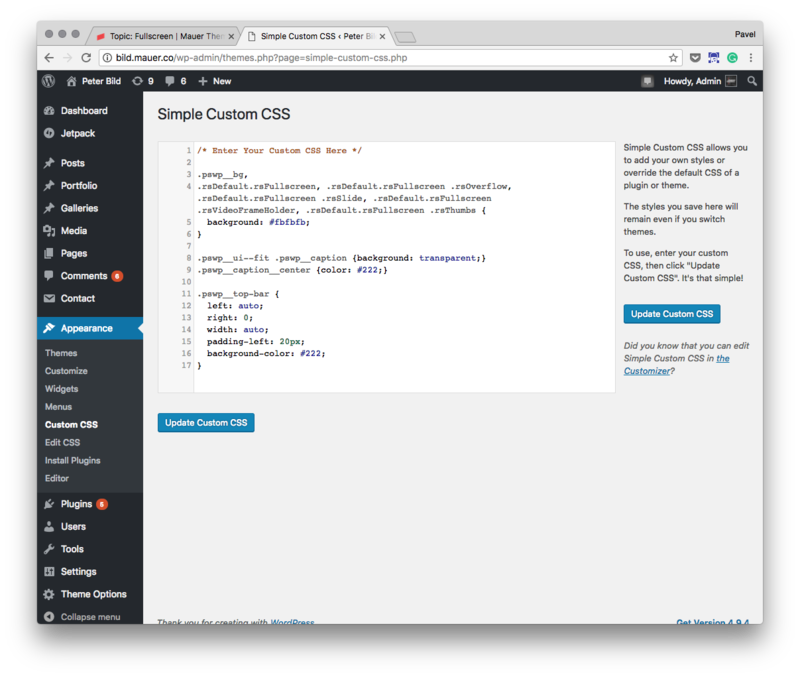 You can add custom CSS with the Simple Custom CSS plugin. Once you install and activate it, in your Admin Panel please go to ‘Appearance’ > ‘Custom CSS’. There insert the code you see above and save. I inserted the CSS code as you suggested and it didn’t change the color to white. Stayed black. Ideas? Can you please post a link to your website? That would help me see why the code may not be working in your case. Sean, looking at the code of the page at drawyourdemons.com I don’t see the snippet that I posted above added. Can you please confirm that you are inserting the code the following way (see screenshot) and that you’ve pressed the ‘Update Custom CSS’ button? I’ve just tested this and it works for me. Ok, now if I clear the cache in my browser I can see the background of the fullscreen galleries being white on your website. Please make sure you clear the cache — as your browser may have cached the previous style. Yes! That works. Thanks. I should have done that first. I appreciate it. What is the standard for the colors you use in CSS #222? I would like to try a different shade of white. By default the theme is suing #222 for text (almost black) and #fbfbfb for background (almost white). These are hex codes. The same ones that you see in Photoshop color picker. So you can come up with a color in Photoshop, and then insert it in CSS. If you enjoy the theme (or the support), please rate it on ThemeForest. This literally takes a moment and creates a huge difference.